Manipur is proud to produce a number of sportspersons in the national and international level arena. As such, Manipur is coined as the Power house of Sports in India. Many players of Manipur have excelled in Olympic Games and also World Championships and bring laurel to this tiny state in the northeastern corner of India. Recently, a young hockey player from Manipur who captained India's Junior Hockey bronze winning team in the World Hockey Junior Cup could make India proud by winning the Junior Hockey World Cup in Germany after 38 years. She is Pukhrambam Sushila Chanu who hails from Thangmeiband Hijam Dewan Leikai in Imphal West district. Born on February 25, 1992 to Pukhrambam Shyamsundar Singh and Pukhrambam ongbi Lata Devi, Pukhrambam Sushila Chanu is the second daughter of her parents. She started playing Hockey for Posterior Hockey Academy Manipur with the help of her uncle Robindro Singh through A. Angina Devi. She got various prizes in Yaosang Sports Meet in her locality. Thus, after knowing her will and talents she started playing hockey. While studying class VIII at Lilasing Khongnangkhong High School, she was elected as the Sports Secretary of the Student's Union in recognition for her interest in sports. 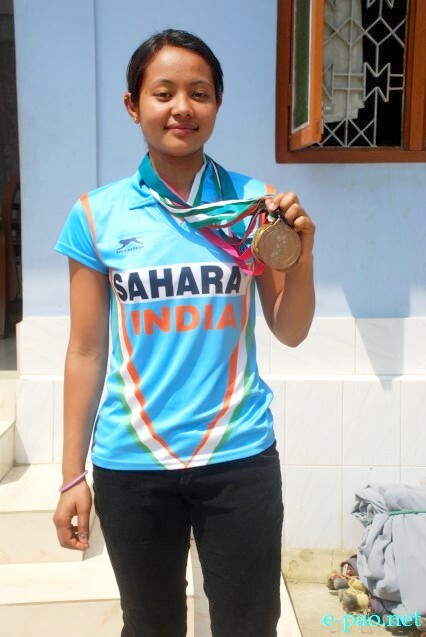 After her association with the game in Manipur, Pukhrambam Sushila Chanu shifted her base to Madhya Pradesh Hockey Academy situated at Gwalior with the help of Inaocha Singh in the year 2006. 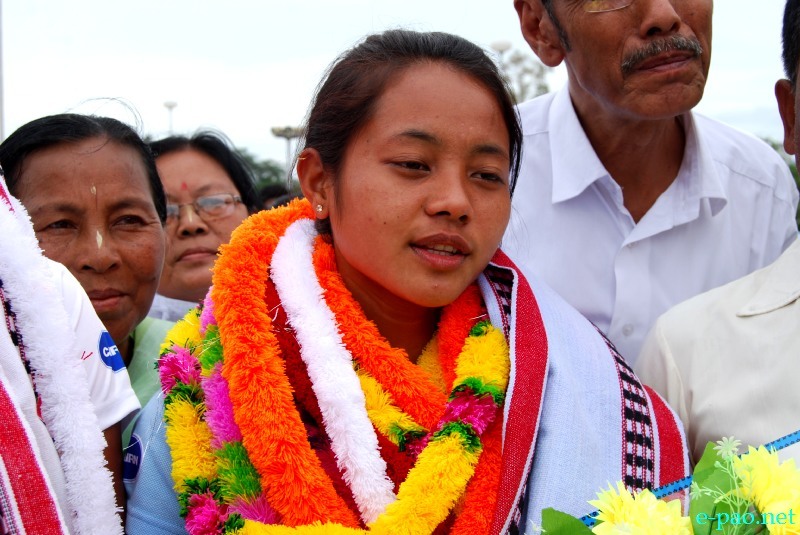 She is following the steps of India's hockey team captain from Manipur like, Tingongleima, Surjalata and Th. Ranjita Devi. Pukhrambam Sushila Chanu first played international match of hockey at Malaysia in the year 2008 by representing India in the under-21 Asia Cup hockey tournament. After her participation in Under-19 Asia Cup hockey tournament at China in the year 2009 she was unable to be in the Indian team for a long period of time due to decrease in her fitness level. But Sushila's hard work overcome this and could be part of India team once again by representing India's senior team in the 9th Series Hockey tournament held at Australia. She then was part of the India team in the Olympic qualifying round in 2012. She also took part in the India team and participated in the World League round played at New Delhi in India. Having played at various senior level international tournaments, Pukhrambam Sushila Chanu recently captained India's junior hockey in the Junior Hockey World Cup held at Germany. Sushila said this is her first and the last time to be in the Junior Team of India. Till now, Sushila has scored three goals for India team at international level. Since three years back, Sushila is employed in the Indian Railways as a Junior TC. Her recent selection for India's team was in the recently concluded Asia Cup hockey tournament held in Malaysia. According to Pukhrambam Sushila Chanu, the authority must provide the players to be equipped with the basic techniques from the initial stage. The parents should also see the wards so that the players reach their professional playing level. The problems faced by the players of the state (Manipur) are mainly due to lack of proper sports infrastructure and also the prevailing law and order problems, which must be tackled by establishing hostels and other required facilities by academies and the local clubs to ensure that more and more quality players can be groomed. Development of Psychological and physical fitness of a player is required. In a bid to bring up more players at the international level, the concerned authorities must note that engaging foreign coaches and providing modern hockey infrastructure and applying the modern techniques to players will be a boon for the players to excel in the international and national level. Discussing on the video recordings after the match and sorting out the performance of the players, will and discipline of players are the basic requirements of player for the excellence according to Pukhrambam Sushila Chanu. Upcoming players must not forget the emerging changes in the techniques and rules and must be acquainted to achieve their goals, said Pukhrambam Sushila Chanu.